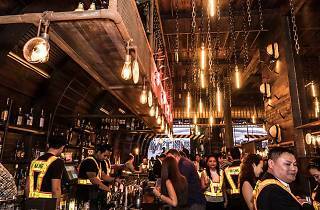 We’ve gone underground and dug out LKF’s latest addition – intriguingly, a mining themed bar. Entering Mine feels like you’ve gone beneath the surface without actually descending. Although the ceilings are a little high and the lights are too bright, there’re chains hanging from the rafters, pickaxes, hammers and other paraphernalia scattering the walls, exposed bulbs and spotlights to help set the scene perfectly.On to the drinks. The Whisky Rebel ($120) is a blend of Canadian Club, Advocaat, Grand Marnier, vanilla syrup and lemon zest. It’s a huge jar of intensely boozy and sweet liquid. Though it’s not necessarily bad, it’s a bit too sickly and reminds us of the British Advocaat-based Christmas tipple, the Snowball. Next, the Deadly Passage ($120) with its overenthusiastic pour of Bacardi mutes the basil and pineapple juice and what’s left is a boozy concoction, unbalanced by the overpoweringly fragrant lychee. All this alcohol calls for some ballast, so we opt for The Cuban sandwich ($98). It’s a decent savoury snack that balances out the sweetness we’ve endured and, though the bread is poor, the oozy cheese and tasty meat are winners.Predictably, Mine is not a standout destination but it is a different concept. 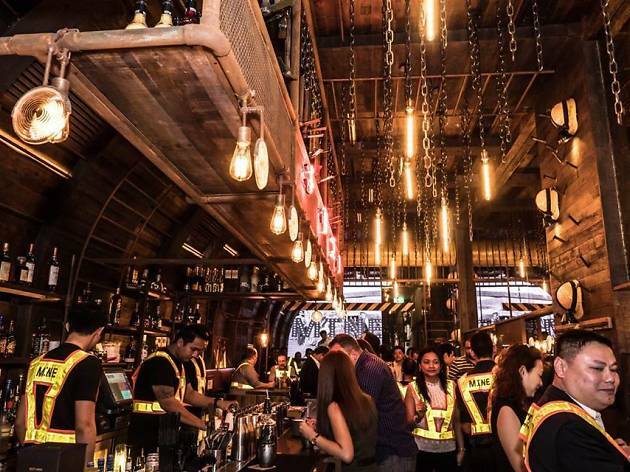 We like that it’s made an effort with its theme and has some cheap happy hour deals, decent snacks and plenty of cocktails for those who prefer a sweeter sip. But, still. Mine’s a pint.